I'm under a bit of a hammer today, so: SPACE MAPS. Now, I don't have a good way to display the full scope of the 100-light year radius of space that I've defined. If I make it small enough to fit on a screen, it's to dense to read properly. I've made some attempts at combining screenshots, which I've found... unsatisfying. Partly because it's showing 3-D space on a 2-D screen. 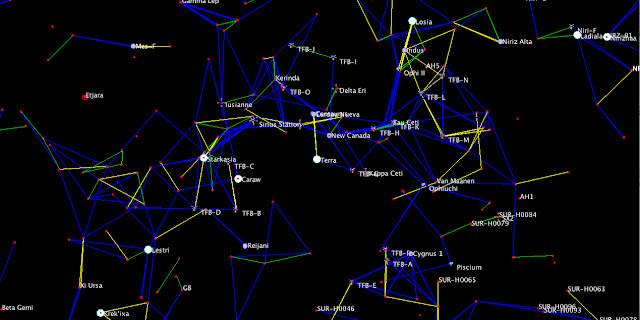 The actual ChView program lets you turn the view on all three axes, so while one can't create a static image that gives a proper sense of the stellar geography, you can move around and get a sense of distance and connections. But this is still a work in progress. Map 1: Centered on Terra (Earth), with a 25 light-year view radius. (Of course, since the screen is wide, we don't see the full 25 light-years to the top and bottom.) The white circles with blue trim are homeworlds: Terra, of course, as well as Starkasia, Caraw, Lestri, Krek'ixa and so forth. The gray circles are colonies: all six human colonies can be seen: Centaurs and Europa Nueva (though their labels overlap, since they are part of the Alpha Centauri binary star system), New Canada, Cygnus 1, Indus and Reijani. Their are also 15 Terran Fleet Bases (the various TFB's). In the right corners the edges of Surani and Nirizhi space are visible. But this is somewhat misleading: One would think that TFB-Bravo and Delta are the closest to Reijani. In fact, neither are: TFB-Oscar is the closest. MAP 2: The same map, with route markers turned on for some sense of scale. Blue lines means less than 8 light years distance. Yellow, less than 6, and green less than 4. But this is also pretty confusing. Let's spin the image. MAP 3: From this angle, we get a very different sense of the geography. We can see how Reijani and TFB-Oscar are in roughly the same direction from Terra now, for one. We no longer see Surani or Nirizhi space, but Paxin space dominates the right side of the screen. And the top left shows a few outlying territories of the Triumverate (the strange symbols-- how ChView renders the Greek Letter "Ψ").